South India is a region that is spread with spectacular temples, forts and beautiful monuments galore that stand as a result of many powerful dynasties that ruled over these lands. Culturally rich South India celebrates its spirituality by celebrating festivals in various forms. Some of these festivals are exclusive for the particular region, while the other festivals, like Mysore Dasara, are celebrated with so much grandeur that they have become almost synonymous with the place. Read about these 6 important festivals of South India. This festival of Hampi that is popularly called Hampi Utsav or Vijaya Utsav is a 3-day-long boisterous festival that has been celebrated every year, from the reign of the Vijayanagara Empire. It is celebrated by putting up a spectacular cultural show that includes performances from renowned artists of India. Cultural music, art and dance are showcased with absolute grandeur. One of the best events is the light and sound show where special lighting of the Hampi ruins, stretched across 15 km, is exhibited. The festival falls in the month of November every year. Onam is a Hindu festival that originated in Kerala. It is celebrated as a rice harvest festival, to honour the Vamana avatar of Lord Vishnu and homecoming of Emperor Mahabali. This is a grand festival for Malayali Hindus and it falls during the months of August or September every year. Many events that take place as part of Onam celebrations include performances of pulikali (tiger dance), onathallu (martial arts), onavillu (music), or making beautiful flower arrangements called pookkalam. Boat races or Vallam Kali also take place during this time. If you had to think of one thing about Mysore apart from its beautiful palace, it would probably be the magnificent Mysore Dasara festival that happens annually in September or October. This 9-day-long festival has been happening for centuries and usually has over 20 events taking place. Procession of Goddess Chamundeshwari's idol which is called the Jumboo Savari, lighting of the Mysore Palace with over 100,000 bulbs, an exhibition held opposite the palace are some of the most important attractions of this grand festival. Blending spirituality with art and dance, the Natyanjali Dance Festival is celebrated as a dedication to Lord Nataraja, a depiction of Lord Shiva. This is a 5-day-long festival that is celebrated during the months of February or March, during Maha Shivarathri. The festival takes place in Chidambaram, Tamil Nadu, which is located around 230 km from Chennai. Performers from all over the country who take part in this festival hold the event in the highest regard and put up the best dance performances every year. Pongal is a harvest festival celebrated in Tamil Nadu, during 14th or 15th January. It is celebrated as Makara Sankranti in the rest of the country while it is called Pongal in Tamil Nadu. This important Hindu festival is celebrated for 4 days, with each day having a different purpose. Crops, like sugarcane, turmeric and cereals, are harvested during this season, and the festival is celebrated as a way of thanking the nature for giving us the grains. This annual festival of Kerala is held in the Vadakkunnathan Temple of Thrissur, when the moon rises with the Pooram star. 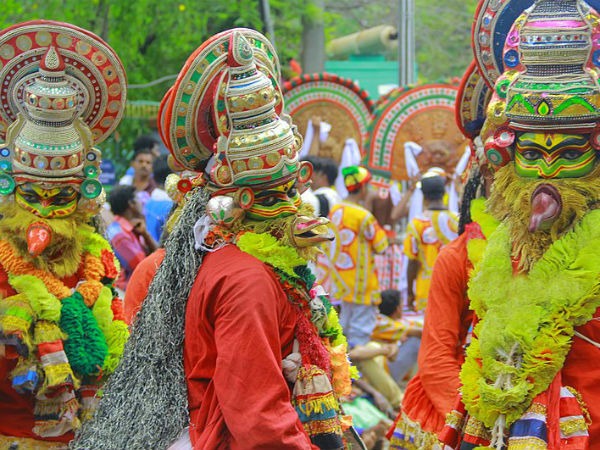 This festival showcases the very essence of Kerala's culture by having a display of elaborately decorated elephants, fireworks, mesmerising parasols and percussion music. Celebrated during the months of April or May, Thrissur Pooram was originally started by Raja Rama Varma, the king of Cochin in late 1700s. Ilanjithara Melam is an enchanting musical performance of over 250 artists, with the instrument called chenda being the star of the show.